Live updates to browser is an important scenario in today’s world. All businesses (Banking, Trading, Healthcare, Retail etc..) rely heavily on internet/browser based apps to reach their esteemed customers. Be it stock quote, news, mail – live updates bring agility to your web application. 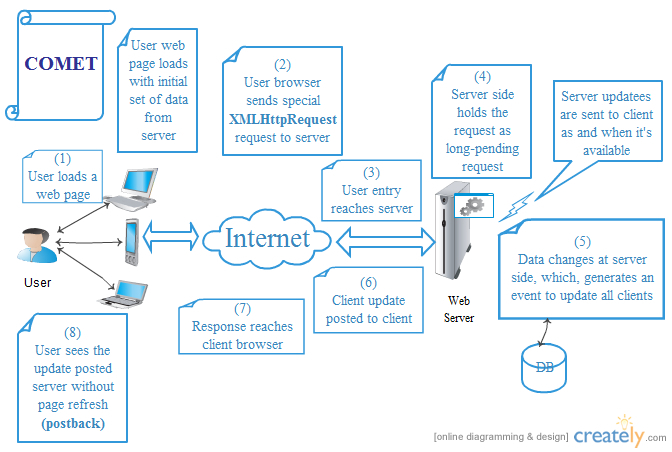 This article is about html5 WebSocket service that streams real time, live data to browser grid. Also, this service can compute complex math expressions (formula) dynamically (at runtime.) Say, for example, you need to live update items such as Stock name, symbol, quantity, price, position (short/long) at real time to user browsers — this service can stream it to browser grid. This service can handle it better than AJAX/ COMET based grids as it uses low latency TCP communication using html5 WebSocket. If you would like to add few more items that are computed based on other items in your data – well, this websocket server takes up that work for you behind the scenes. Let’s consider, you would like to add a new item Total cost (where Total Position = price * quantity * Long/Short), this service computes it automatically. Given the math expressin formula, this service performs the computations behind the scenes at runtime. If all this is not enough, it can add new formulas on the fly. Say, you deployed this grid to production. Someone thinks your formula is wrong and needs immediate change. Just modify the formula at server side. All client browsers will see live updates with right formula. Isn’t this nice. Open test.csv file in an editor (such as TextPad, Notepad). Modify the value in the CSV file and save it. 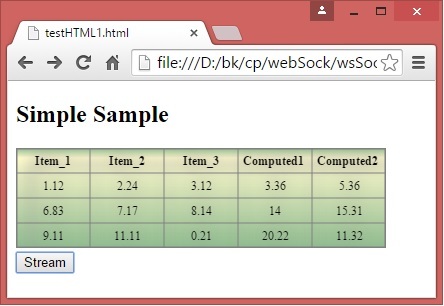 Using this websocket service in your application is pretty simple. Avoid exposed service: Avoid exposing an another service throug websocket without proper authentication/authorization in place. Websocket as of now do not support authenticaion/authorization. 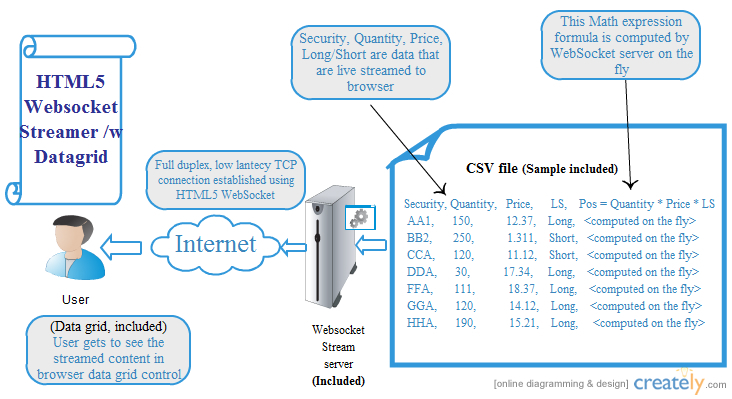 The http connection need to perform this work before handling stepping up connection to websocket. As in above picture, AJAX calls are made by browser behind the scenes, i.e., part of webpage is updated without reloading the entire page. Typically AJAX messages are small. AJAX calls use a special type of request called XMLHttpRequest. When response received from server, this information is presented to user without refreshing the entire page. For user, it appears as if the web page responds instantaneously without a call to server. AJAX is good for user created events. Here in the above explanation, user typed into a web page (such as google search box) to initiate AJAX call to server. Consider another use-case, say, a live data grid use-case: AJAX is not a suitable solution. Because in live data feed, server creates the event. That is, server gets to know when the new data arrives. Clients making timer-based AJAX calls unnecessarily increases network traffic, let alone, dries up all server resources. If the data passed is big, then, sever goes to a state where it cannot accept any new connections. Timer-based AJAX calls clogs server with unnecessary calls. To solve this, COMET (a.k.a Reverse AJAX) was actively used. Reverse AJAX/COMET lets server push data instead of client polling for data in specific interval. This is perfect for server initiated events use-case such as live-feed to browser. As in above picture, Client calls to server are put on hold by server. Hold is different from disconnect. Holding a call means server keeps these open connections as pending. When new data becomes available for update, server sends response through these pending connection. This is much better than AJAX, but not perfect. This suffers from inability to handle error reliably, restriction on number of connection, latency issues, etc. Let’s look at how basic html5 connection is established. html5Stream.StartServer is a simple method that accepts client connection and processes it asynchronously. This method also spawns a separate thread that processes all client publishing work. We will take a look at this method later. For now, this method is not html5 significant. It’s plain simple socket accept, nothing more. Html5Stream.AcceptConnection performs the necessary html5 specific handshake with client. This function performs the important handshake necessary for upgrading http to tcp connection. Create a socket and bind to a specific port. Based on handshake details, answer key needs to be generated. Take a look at html5Stream.prepareClientResponse method. 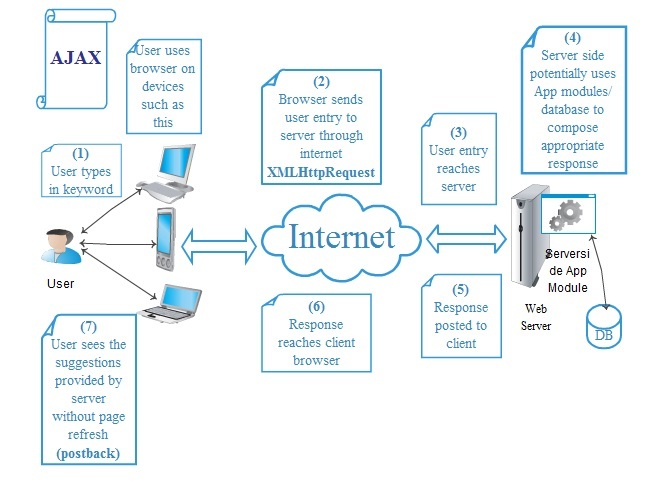 This method prepares a handshake response from server to connecting client. Handshake response looks as below. If you read, surprisingly, it’s quite simple. That’s it, handshake complete. Now on, client and server can enjoy low latent, reliable, full duplex communication between each other. Now, you are probably wondering, how simple this is, correct? So to avoid being simpler the messages are not raw. Communication messages between server and client employ data framing (remember, Einstein said, not simpler). Just kidding, as in reference (3), Data framing is employed to avoid confusing network intermediaries and for security reasons. Even for SSL/TLS this masking is performed. Fortunately, It’s not that difficult to implement. I implemented the part that we need for our grid to work (brevity). Take a look at methods html5Stream.encodeData and html5Stream.decodeData. Now that handshake and encoding is complete, we are ready to stream data. html5Stream.publishAllmethod does this work. It waits on dataReceived event. This event is set when user calls html5Stream.setStreamData. i.e., when data is ready to be published to client. The available data is encoded and sent to client. Each client in the list is enumerated and sent with new update. => A free file streamer is added with sample project. Open the CSV file, add new columns, rows. Also try adding new formula. It’s quite interesting to see the dynamic update getting generated to browser screen on other machine. Adding new computed columns has never been easier than this. This entry was posted in ASP.NET MVC, C#, Knowledge, Problem solving, Uncategorized. Bookmark the permalink.